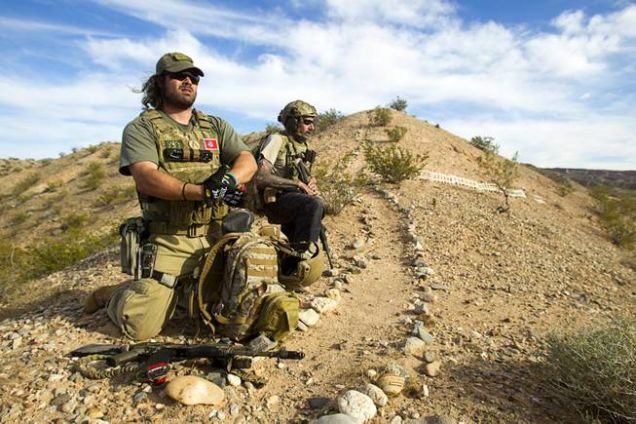 Nevada Militia Sets Up Armed Checkpoints, Demands to See Drivers' I.D. They came to defend an old cattleman and their principles of life, liberty, and property. But apparently other rightful property owners in rural Nevada don't feel terribly free under the security regime recently built around them by the militiamen protecting rancher Cliven Bundy. Even though mainstream America was never with him, and the rightward fringes of mainstream America abandoned him after his 48-hour-virus of racial frankness, Bundy is still attended by untold numbers of camouflaged and heavily armed dudes dedicated to continuing "his fight with the government over his refusal to pay fees for his cattle to graze on federal land," the Las Vegas Sun reports. A growing number of Bunkerville residents want to see the armed militiamen guarding rancher Cliven Bundy leave Nevada, according to a letter from Rep. Steven Horsford, D-Nev., to Clark County Sheriff Doug Gillespie. The letter also says militiamen have a presence on state and local roads as well as federal highways. In some areas, according to the letter, militiamen have set up checkpoints where drivers are stopped and asked to provide a proof of residency. They've been seen carrying high-caliber weapons and keep a round-the-clock security detail on Bundy. Because nothing says liberty and freedom like setting up armed checkpoints to verify your residency. Reid Hendricks of Camden, Tenn., and Jim (no last name provided) of Las Vegas take up a position on a hill by Cliven Bundy's ranch near Bunkerville on Tuesday, April 15, 2014. Hendricks is a former Marine (honorably discharged) and has worked as a police officer and a high school history teacher, he said. I can't speak for "Jim", but clearly, there can be no better advertisement for the intellectual consistency of your armed anti-government movement than Reid Hendricks, former Marine (honorably discharged), former police officer, and former high school history teacher. For a bonus, check out the interview above with Cliven Bundy's top militia aide. "One thing I want everybody to know: The character of this man is unmatched," he says of Bundy. "The things that I've heard him say, the private conversations I've had with him, this man is likened to George Washington in my eyes, and I say that as no small statement." Indeed, it is no small statement.